I just wanted to say thank you so much for squeezing me in today I really appreciate it. Doug was right on time and was amazing and helped me a lot. He did an AWESOME job and gave me a lot of information to help me with the bed bug problem in my apartment that I just moved into. I’m super appreciative to him and your company! Thank you to him and your company so much! I really hope I never have another pest problem again but if I do it will be you guys that I will use. And I will recommend your company to anyone that has a pest problem. Again, thank you so so much!!!! I spent three months dealing with apartment managers with regards to the various bugs and roaches living inside my stove and kitchen. Every morning, my daughter and I would open the oven or turn on the light and they would all scurry into holes or crevices. Totally freaked us both out! No one in the manager’s office ever called me back to discuss plans to remove these bugs. I opted to contact the corporate office and I was passed off to client/tenant relations. It was then I was told there was a different company who came out to treat my kitchen, but it did not work. They called TNT Termite/Pest Solutions 365 and sent Paul. Paul came out, was on time, explained the various types of bugs/roaches and the treatment plans he would be taking to cure this problem once and for all. He told me the worst-case scenario to the best case while answering every one of my questions and concerns. I felt like I was talking to an old friend, as he was very easy to communicate with. His compassion for work was clear and his dedication to doing the best job possible was evident. After his first treatment, I did not witness a single bug/roach! He came back a week later and did another treatment, as he picked up the traps he had left the week prior. Again, I have seen no bugs or roaches. Yesterday, he returned my phone call and offered to go above and beyond the call of duty. I thanked him and told him he was not the apartment’s maintenance man, but appreciated his offer to come out and clean the stove which had housed this family of bugs/roaches since I moved in. I will not use the stove as there is a strong smell of chemicals and/or dead bugs which I do not want in my food. This smell has been in my stove since I moved in and must have been residue from the treatment performed by the other company. It is still under debate with my apartment complex who has been negligent since I moved in. They say because the stove is still “working” they will not replace the stove and insist I use it regardless of the smell. If not for Paul, my daughter and I would still be living with all of these bugs. Thank you for allowing me to express my appreciation and admiration of Paul and TNT Termite/Pest Solutions 365. You will get my highly praised recommendations spread to all I come in contact with. As a highly active real estate professional, it is great to know through personal experience that the company I have referred out is truly a top-notch, Class A company whom I am confident will take care of our clients. 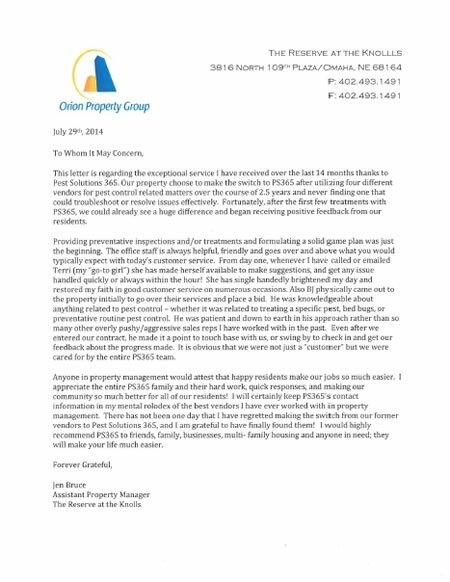 This letter is regarding the exceptional service I have received over the last 14 months thanks to Pest Solutions 365. Our property chose to make the switch to PS365 after utilizing four different vendors for pest control-related matters over the course of 2.5 years and never finding one that could troubleshoot or resolve issues effectively. Fortunately, after the first few treatments with PS365, we could already see a huge difference and began receiving positive feedback from our residents. Providing preventative inspections and/or treatments and formulating a solid game plan was just the beginning. The office staff is always helpful, friendly and goes over and above what you would typically expect with today’s customer service. From day one, whenever I have called or emailed Terri (my “go-to girl”), she has made herself available to make suggestions, and get any issue handled quickly or always within the hour! She has single-handedly brightened my day and restored my faith in good customer service on numerous occasions. Also, B.J. physically came out to the property initially to go over their services and place a bid. He was knowledgeable about anything related to pest control – whether it was related to treating a specific pest, bed bugs, or preventative routine pest control. He was patient and down-to-earth in his approach rather than so many other overly pushy/aggressive sales reps I have worked with in the past. Even after we entered our contract, he made it a point to touch base with us, or swing by to check in and get our feedback about the progress made. It is obvious that we were not just a “customer” but we were cared for by the entire PS365 team. Anyone in property management would attest that happy residents make our jobs so much easier. I appreciate the entire PS365 family and their hard work, quick responses, and making our community so much better for all of our residents! I will certainly keep PS365’s contact information in my mental Rolodex of the best vendors I have ever worked with in property management. There has not been one day that I have regretted making the switch from our former vendors to Pest Solutions 365, and I am grateful to have finally found them! I would highly recommend PS365 to friends, family, businesses, multi-family housing and anyone in need; they will make your life much easier.